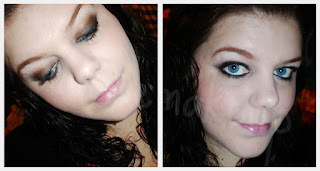 Sophsterlicious • UK Blog: Smokey Eyes FOTD. So, I wanted a nice black/brown dramatic-ish smokey eye - Here it is! I used urban decay zero for the black, over the top of GOSH black ink liner and for the brown I used a L'oreal HIP one, I can't remember the name if it, Sorry! On the lips I have Palest Lavender from Barry M with some gloss on top and my foundation is Revlon Colorstay in Ivory, and for blusher I am wearing Almay - Peach. Anyway questions or anything, let me know in the comments!